Bundaberg Lifeflight RACQ Rescue helicopter who transported a 9-year-old boy with a suspected irukanji sting on Fraser Island's western side to Hervey Bay Hospital on December 19. UPDATE (10.25AM): TWO teenagers were among six people requiring medical attention after being stung by Irukandji in Fraser Island's waters. 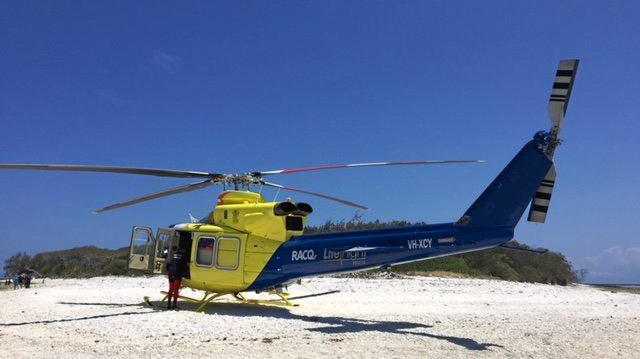 A Lifeflight rescue helicopter airlifted the two siblings on Friday afternoon after they reported being stung while swimming off the back of three boats in the waters off the north-west side of the island, about 5km south of Wathumba Creek. They were among six people who reported being stung that afternoon. The helicopter flew the flight paramedic and another Queensland Ambulance Service paramedic to the island, landing on the beach. They were picked up by boat and taken to the patients' cruiser. The paramedics and QAS officers who were brought from the mainland by Volunteer Marine Rescue, treated the half dozen patients on board the cruiser, for over an hour. Two teenagers were assessed as requiring further medical treatment. The pair and the two paramedics were ferried back to the waiting RACQ LifeFlight Rescue helicopter and flown to Hervey Bay Hospital. The male and female patients were in a stable condition. 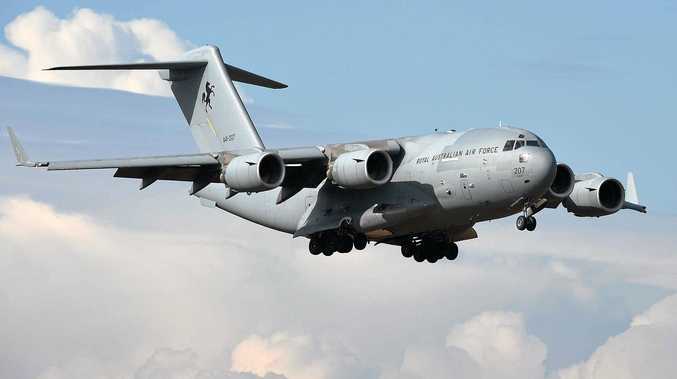 The latest stinger incident occurred less than fifteen minutes after the Lifeflight crew returned to base from an earlier mission today, where a woman in her 20s was airlifted from Fraser Island to Hervey Bay Hospital suffering severe symptoms from a marine sting. It is suspected her injuries were caused by a blue-bottle. EARLIER: A WOMAN in her 20s was the fifth person to be treated for a suspected marine sting off Fraser Island these holidays as authorities take steps to make holidaymakers aware of the potential dangers. The woman was stung around Sandy Cape just after 2.05pm yesterday and was airlifted to Hervey Bay Hospital just after 4pm. A Queensland Ambulance Service spokesman said she was transported in a stable condition. It follows a series of marine stings, some suspected to be irukandji, on the island throughout the past two weeks. On Thursday, a 26-year-old man was stung while snorkelling off the western side of the island mid-morning. A Wide Bay Hospital and Health spokeswoman told the Chronicle the man was kept under observation before being discharged. Two children were among three others to have been treated for stinger injuries after swimming off Fraser Island's western side. Wide Bay Capricorn Surf Life Saving Branch's life saving service coordinator Julie Davis confirmed Hervey Bay Surf Life Savers conducted stinger drags yesterday. "Drags will continue to be conducted from Moon Point and Wathumba on Fraser Island's western side," she said. "The Life Guard Information Service began Thursday with the help of Volunteer Marine Rescue and will run until Australia day." In it's second year of operation, the information service provides a life guard to deliver pamphlets on marine stinger safety and treatment to campers, vessels and charter boats on Fraser Island. "We just want people to be aware of the possibility of irukandji in the area and be vigilant especially with children," Ms Davis said. "It is not a common thing to be stung, there is no set pattern and no particular time or tide you are more likely to be stung. "The best thing to do if you think you have been stung is dose the area in vinegar, call 000 and get to a hospital as soon as possible. "There are stinger suits available for purchase if anyone would like them." Burnett Local Marine Advisory Committee chairwoman and marine scientist Sue Sargent said changes in the East Australian Current, which is found on the eastern side of Fraser Island, was a contributing factor to the changes in species. "Irukandji are not typically found this far south and due to factors like climate change the EAC has sped up meaning juvenile species which enter it and would not normally have survived the slower journey are being found further south where the water is an ambient temperature for them," she said. "I'm not a specialist in jellyfish but we are also seeing the same with tropical fish species which is a great thing for the local diving industry. "It is a mixed bag but it is ultimately still uncommon for people to be stung by irukandji on the Fraser Coast, the biggest challenge is that with the holidays season there are more people in the water which increases the likelihood of people being stung."